Home » Exercises » Quick Tip: Do you have a coach for running recovery? Are you running in the Honey Badger Half at the end of October? Or training for the Golden Gate Half in November? If so, we want to hear from you! Because we believe in the power of bodywork to support runners in training — and many of our clients do too. Below, check out some training advice from Psoas client and Ironman Champion, Derk de Korver. He placed 4th in his division at the 2017 Ironman World Championship and 1st overall at 2018 Ironman Santa Rosa! He shares how the Psoas clinical team helped him win in Santa Rosa, and why it’s so important for runners to emphasize recovery. So, soak in the wisdom and don’t forget to check-in with us. We’re here to listen, and to help design a bodywork plan that best supports your specific athletic goals. “My work with Psoas Massage + Bodywork started a couple of months before Ironman Santa Rosa when I realized that, in order to reach my full potential, I couldn’t only focus on training. I also had to incorporate a more structured approach to recovery. Having been to many massage therapists over the years, I had never worked with a great massage therapist. By that I mean my previous bodywork had been just one-off visits when I felt the need or had the time. I immediately noticed that Psoas’ approach was more about the big picture. They inquired about my entire race and training season and recommended sessions accordingly. They also assigned me experienced therapists with an athletic background, practitioners who would best understand what I put my body through during training. I really love how detailed and serious they are about their work — as this is exactly how I approach my training. 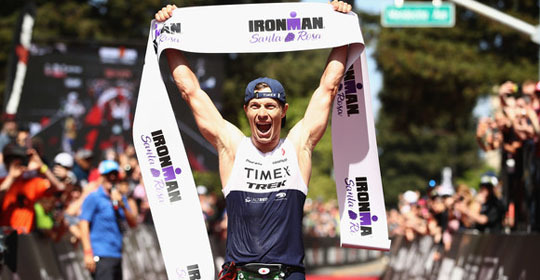 Psoas played a big role in my victory at Ironman Santa Rosa.